A month or so ago, I received a spam message in my work inbox that was forwarded from a legal organization I belong to. 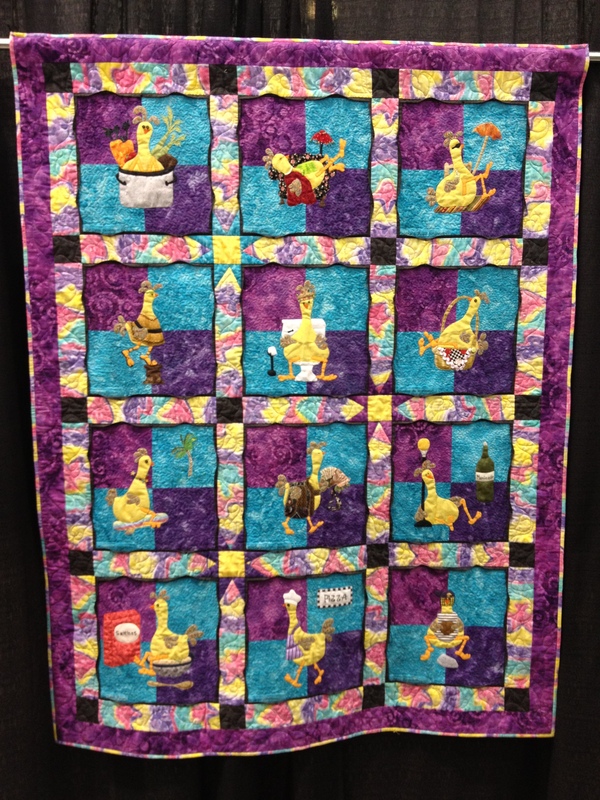 The solicitation related to a quilt expo in Madison, Wisconsin. It’s probably the only spam message I’ve ever appreciated. I thought about the message for a long time. 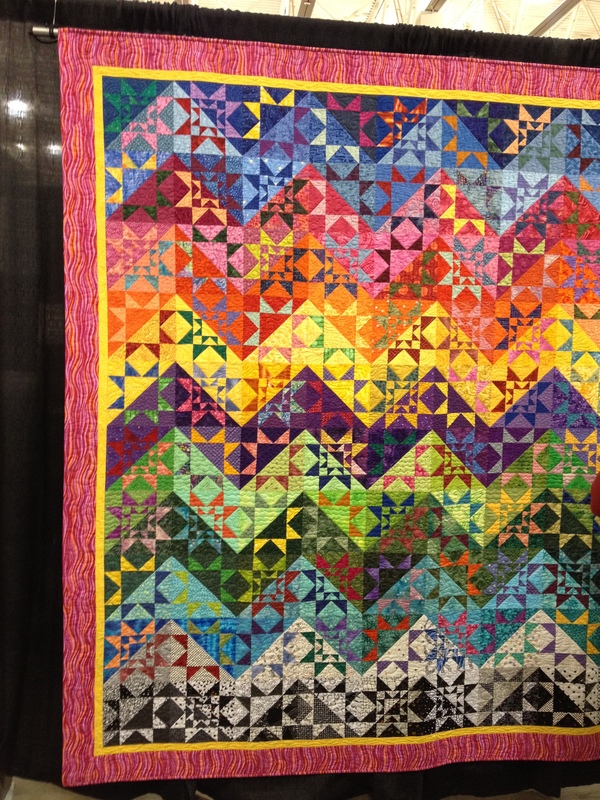 Given how short a time I’ve been making quilts and the limit of my skill so far, it seemed like a bit of a stretch that I’d need to attend a quilt expo to get ideas. Not to mention the fact that I just started a project that could easily take me 10 years to complete. I discarded all these arguments because Madison sounded like a really nice city to visit for a quick overnight trip. Entrance wasn’t expensive, and since I work in the suburbs an hour and a half from my Chicago apartment, I reasoned I’d already be almost halfway if I left from the office Friday afternoon. I really just wanted to see what colors and patterns other people use–beyond an internet search, which has been my only experience so far–and this seemed like a fun opportunity to do so. I felt a little out of sorts when I arrived. Everyone else came with at least one other person. I didn’t know where to begin, and I didn’t have an expert with me to consult (or even someone whose presence would force me to pretend I knew what I was doing). 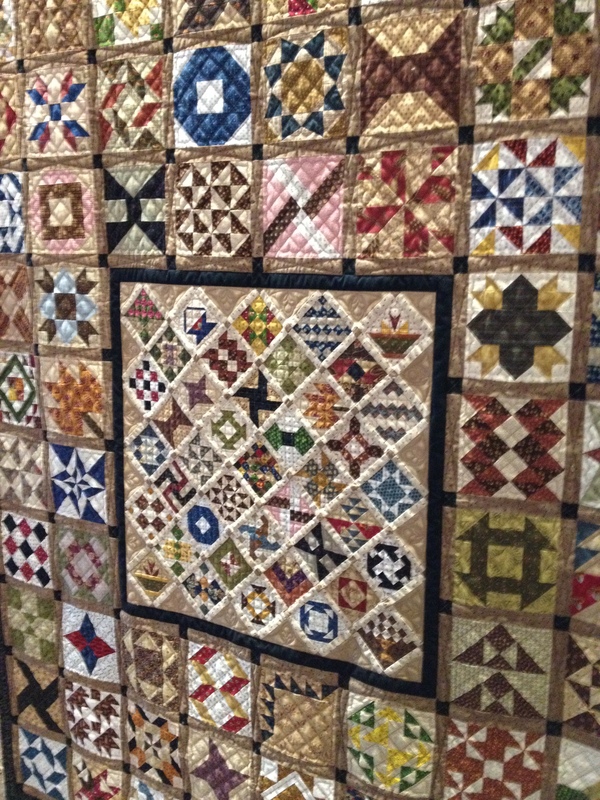 Luckily, the quilt contest exhibit was right by the front entrance. I decided to start there. I bought some embroidery patterns from a vendor that are in a similar style. 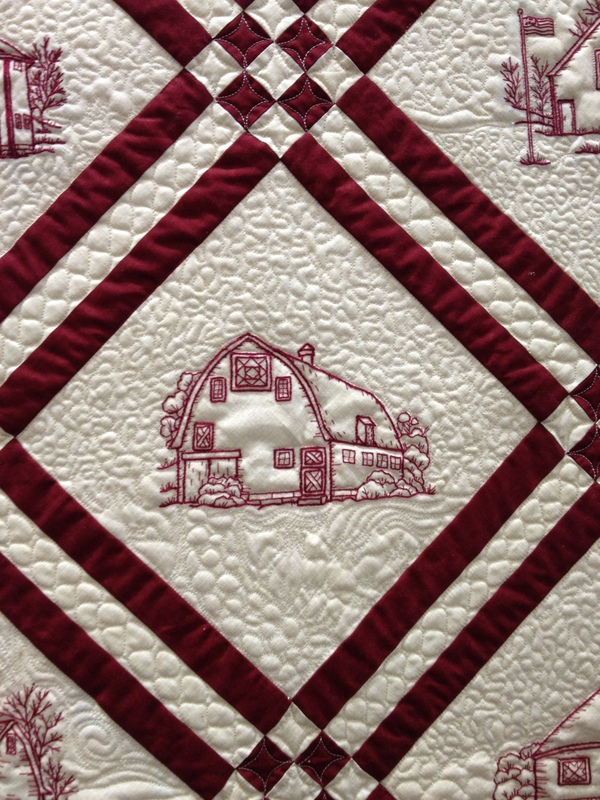 My plan is to review the templates and use them as a stylistic framework to create my own patterns of barns and farmhouses that were part of my childhood. This was based on the success of my first-ever embroidery project, which I began in my hotel room the night before the expo. 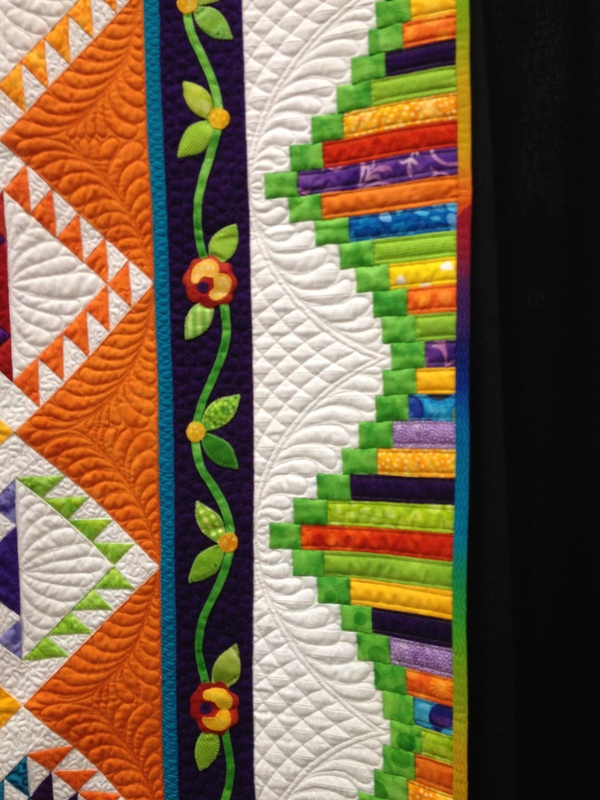 When could someone ever be more excited about quilting than the night before a quilt expo?! 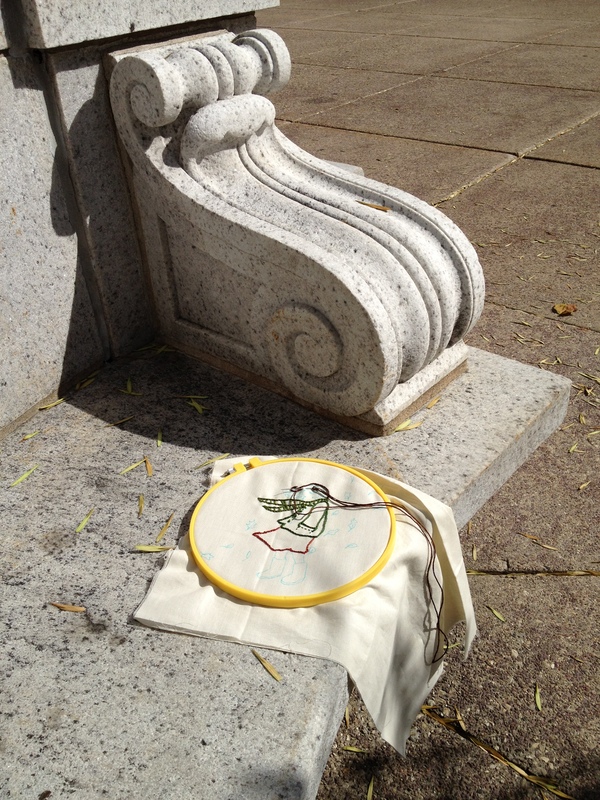 But I didn’t want to lug my sewing machine with me, so I needed a more mobile project that would expend my extra creative energy. 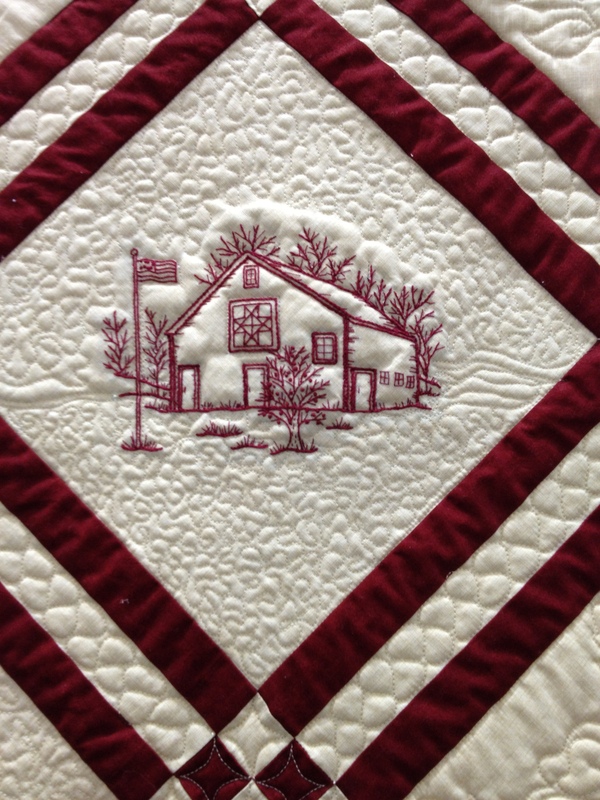 There’s a block of my newest quilt that had a letter “B” on the layout I drew. 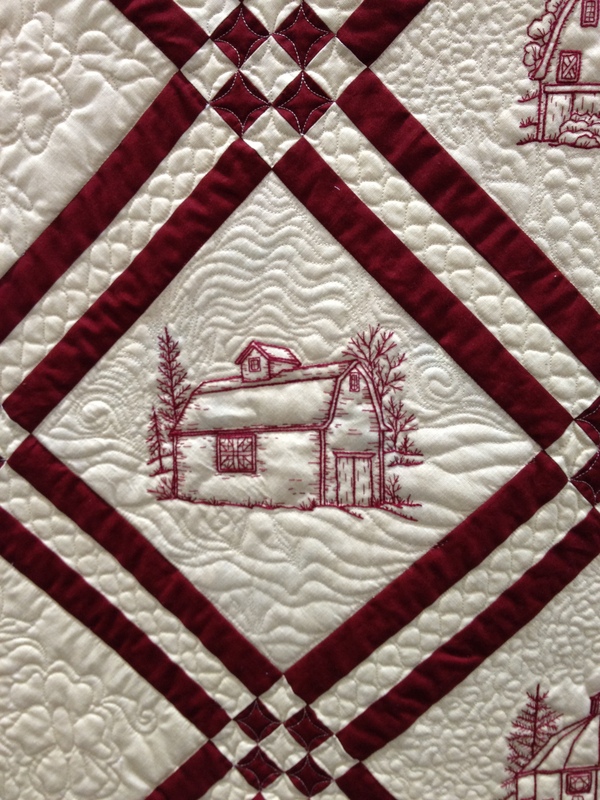 I figured if I gave the quilt as a gift, that would be a great place to embroider the couple’s name, and since my boyfriend’s last name starts with B and most of his siblings are unmarried, they seemed like likely candidates. Then I got more realistic and thought how hard it would be to part with a quilt after making dozens of personalized blocks. So I picked a pattern I liked for myself instead, Sarah Jane Studio‘s October–which matches the autumn theme of my quilt colors. After I finished looking at the contest exhibit, I had just enough time for coffee before I went to Nancy Zieman’s class: Nancy’s 30 Favorite Sewing & Quilting Techniques. My mom learned how to sew by watching PBS’s Sewing with Nancy, so I had all the giddiness of someone about to meet a favorite celebrity. 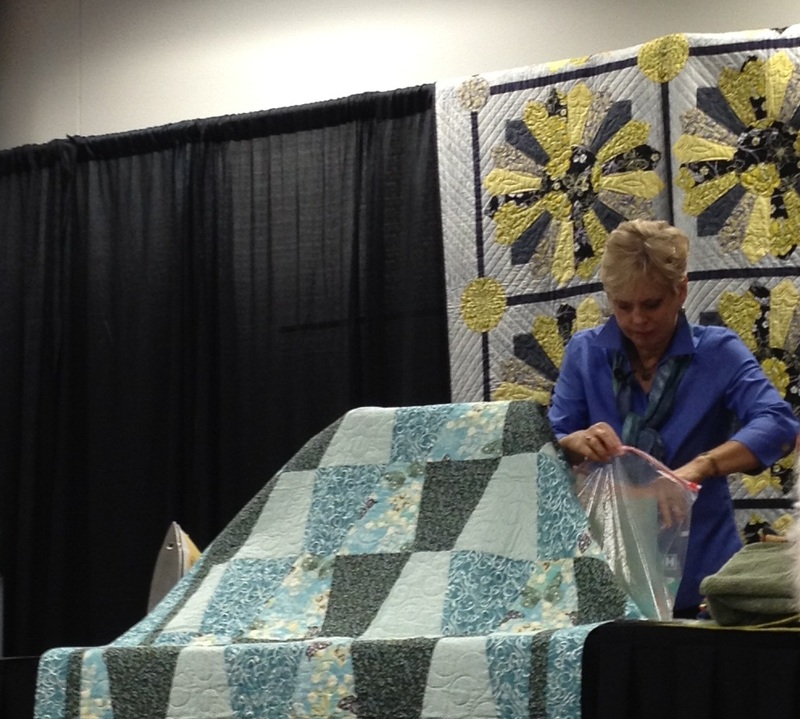 At the end of the presentation, I even helped take down the quilt that was a backdrop for her presentation! 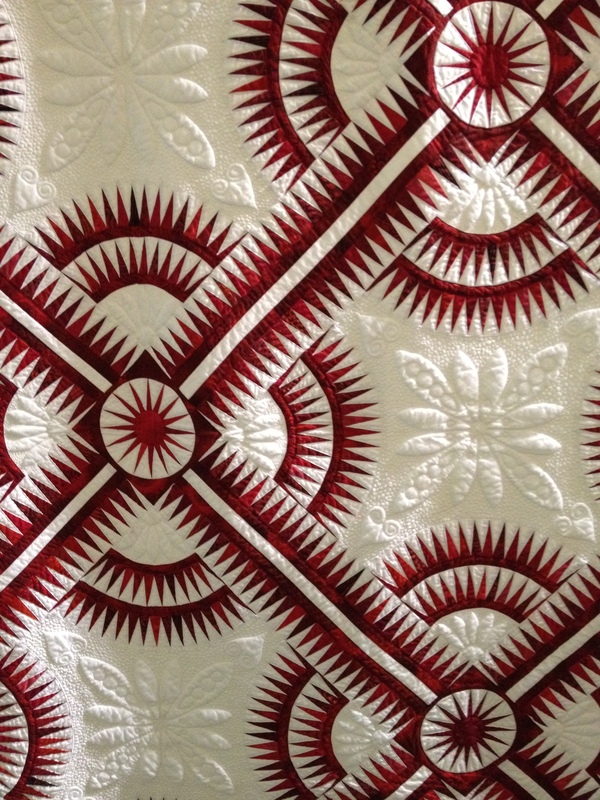 That’s right: I touched a quilt Nancy sewed! Haha. She was gracious enough to take a photo with me before I left, too. I need to learn how to use wool and felted wool. There was lots of it, and it was so pretty! My favorite booth was for a store called Primitive Gatherings. 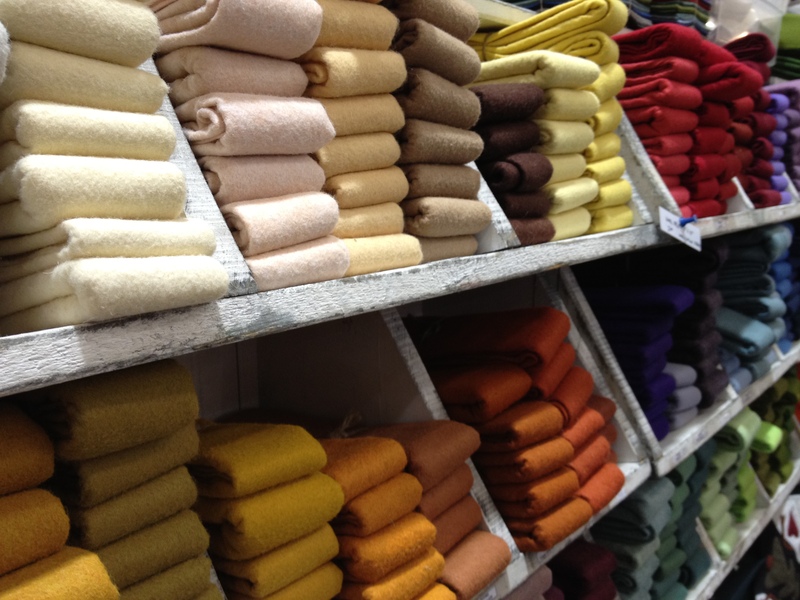 They had such a fantastically gorgeous selection of fabrics. When I walked past on the way to Nancy’s class, I stopped a few seconds to grab a business card (well, slip of paper) and drink in the colors. Afterward, I was surprised there was a line just to get into the booth! A lady walking by said, “That makes sense. It’s all in the name.” Apparently, this place is famous. 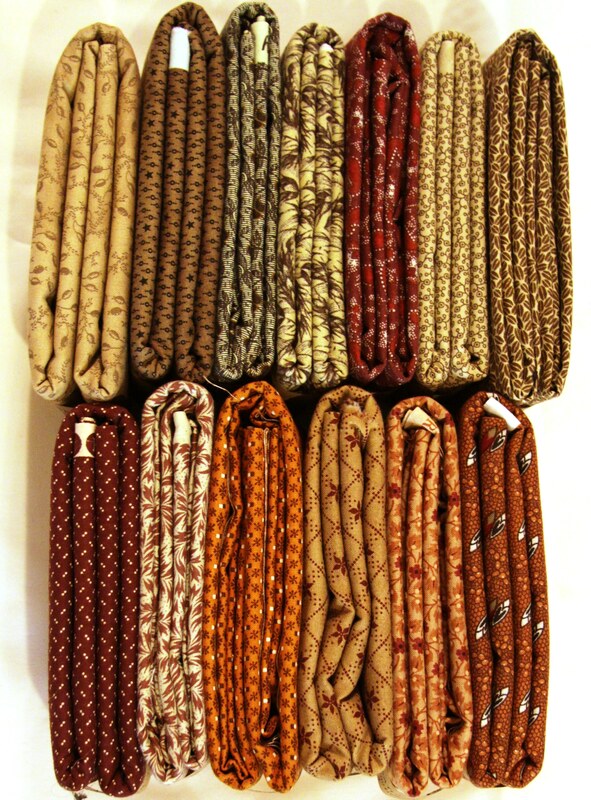 I bought a bunch of fabrics for the back side of my Dear Jane quilt. Since I’m thinking of doing quilt-as-you-go, I could make each square a different fabric. They’re so pretty, maybe I’ll even use that side as the front! I was disappointed when the $60 I spent didn’t get me one of their printed bags. This is actually very stupid. I mean, I have a ton of printed bags. I usually avoid getting more because I don’t want to store them. But the salesperson told another woman she had to carry the bag with the logo out, and then I unconsciously waited for him to tell me the same thing when I made my purchase. (I was browsing when the other woman checked out.) No luck! Like I said, I shouldn’t have been disappointed because I don’t really need another bag. And with as popular as they are, it would’ve been impractical for them to print bags for every customer, regardless how little each spent. I get it. I left fairly early. I was glad not to have to wait around for an expo partner and congratulated myself for having decided to go alone, after all. I had a great day and am glad I went to the expo. 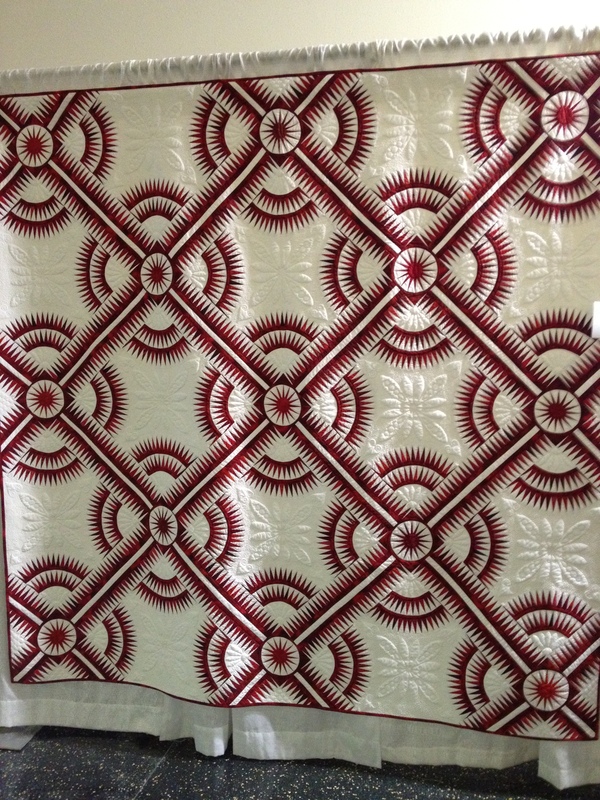 In the end, I think the target audience is people who are much more into quilting and batik fabrics than I am, but it was still a nice way to see a wide variety of fabrics all at once. Would I consider going again? I really don’t know. 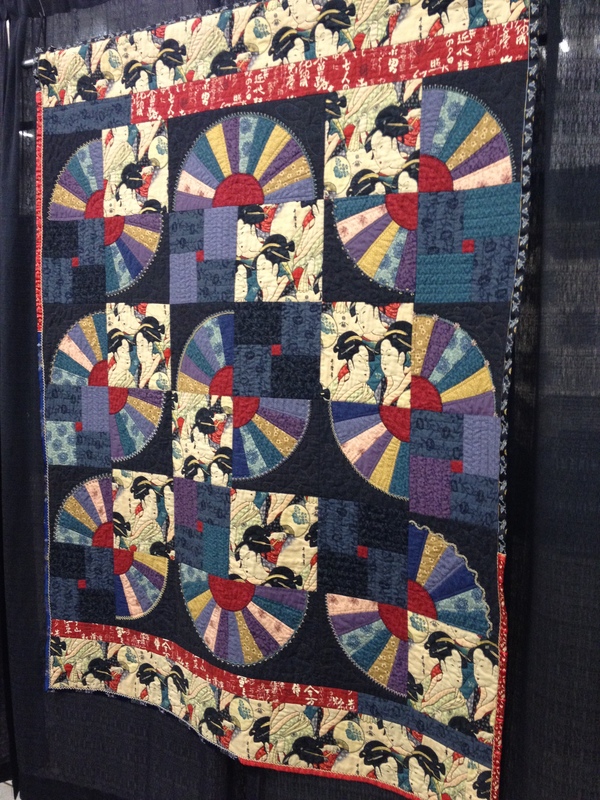 But I couldn’t have asked for a better first quilt expo experience! 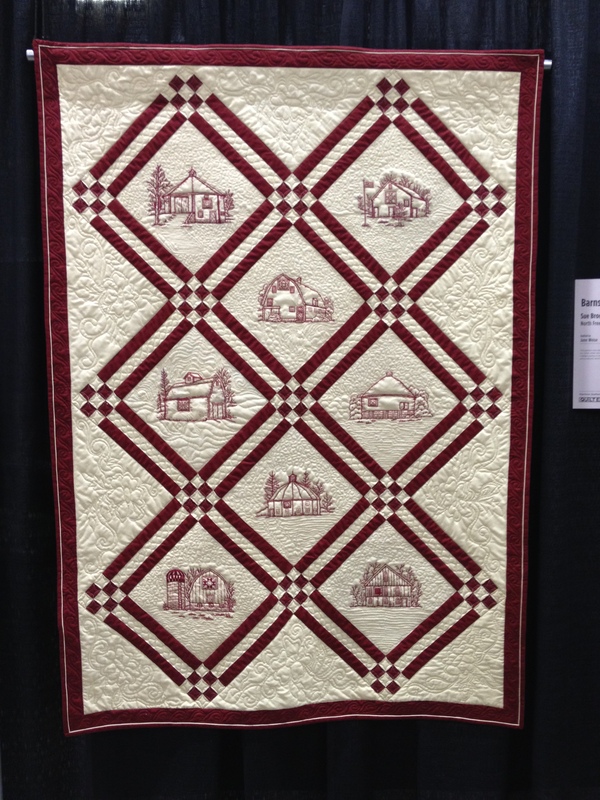 Categories: Other Sewing, Places & Events, Quilts | Tags: autumn quilt, dear jane, embroider, embroidery, expo, farmer's wife, madison, nancy zieman, quilt, quilting, road trip, sarah jane studios, sewing with nancy, wisconsin | Permalink.